The modern Israeli freeway signs pointed to Caesarea Martima, a national park just north of Tel Aviv. It was our destination on our tour of the Holy Land. Geographically and historically, it was a good place to begin our exploration of the Land. 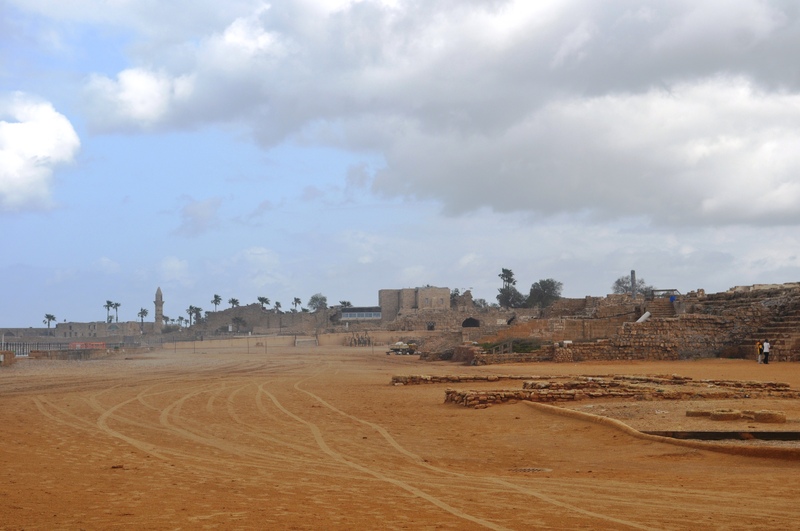 This city by the sea was built by Herod the Great in honor of Caesar Augustus. The archaeologically rich site is the only place where Pontius Pilate is given a place in history outside of the Bible. He is the one, as governor, sentenced Jesus Christ to death by crucifixion. His name is written in stone as one of the governors of this amazing city. 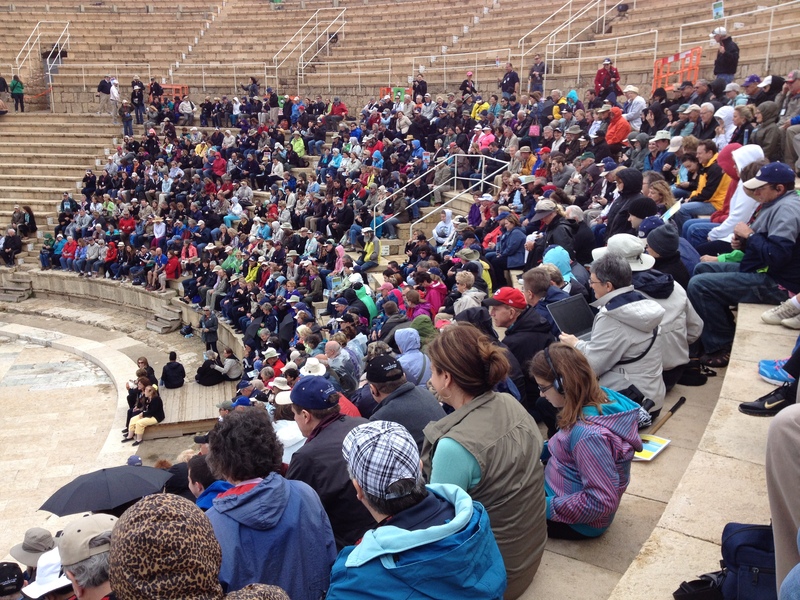 Our intimate tour group of 800 strong, transported by 18 buses, piled into the ancient amphitheater. We experienced our first of several phenomenal worship services. 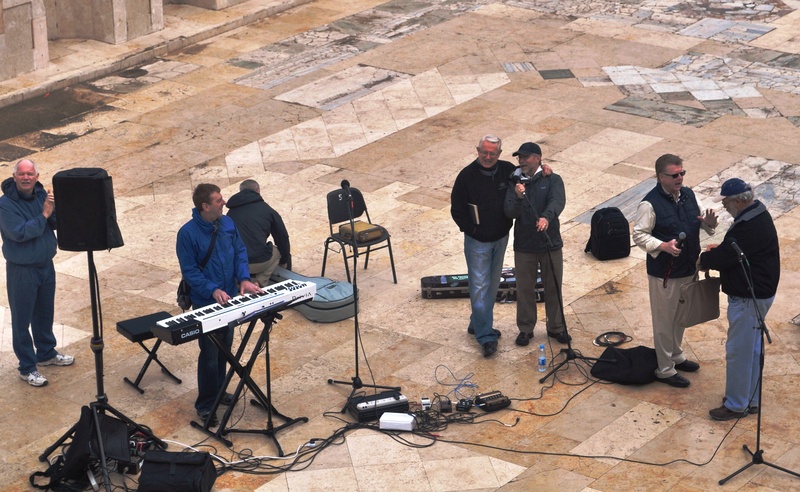 Powerful songs knitted our hearts together. 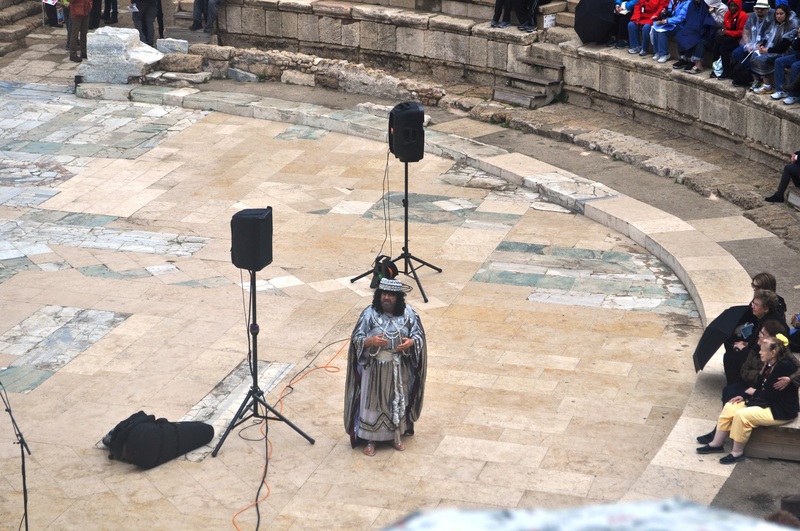 A gifted thespian donned ancient garb and delivered a rendition from King Herod. We reflected over the visits to this regal city by Peter and Paul during the church’s early beginnings and initial missionary journeys. When the morning message started, so did the weather. The wind kicked into high gear. Umbrellas went up to shield us against the rain. The swirling gusts upturned many umbrellas. We huddled together and survived the distraction. All of the lead worshipers were spared electrocution. Then, we walked. Our guides called their groups of 40. Through the world of personal electronics and varying frequencies, we each tuned into our assigned guides and walked through the ruins of this ancient city. Peter once was here. Perhaps it was here that he baptized Cornelius. Maybe here the Apostle Paul boarded a ship that launched the missionary journey that forever marked how Christianity was constantly broadcasting the good news of Jesus to the entire world. Long ago thousands lived in luxury and were introduced to God’s plan to bring salvation and joy to a world that needed hope for the eternity that awaited each one once their days on earth were done. Paul may have suffered the humiliation of imprisonment here. A ship may have picked him up in this very port city and brought him to his final days in Rome. While lives of the first church were once active here and her enemies may have tried to resist this new faith born out of the Resurrected Jesus, the Gospel began and would explode around the world at this very port. This is very well where the church ignited a worldwide lifesaving movement. It is still growing today.